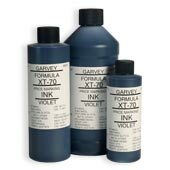 Question: What is the difference between Fiebings leather dye (Voilet) and Garvey XT-70 (Violet) is there much difference? Keep in mind i'm from the uk and garvey is hard to get? Answer: (AP Reply) One is made in the USA and easier to get. Question: Is it dye-based? And will it dry-out nibs? Answer: (AP Reply) Yes and no. Answer: (AP Reply) Unfortunately these are set at Manufacturer Recommended Pricing. Meaning, we can/t sell for less. Alternatives to Garvey are now starting to pop up on the market which is great, but we ourselves are having a hard time finding an alternative that is on par with the classic Garvey recipe (which is probably why they can charge everyone so much)! Question: waait! 4oz of this is 24$ but 4oz of smash is 8.99$ why????? Answer: (AP Reply) One is a dye and the other is an ink as well as 2 different brands. Question: What's the best garvey to marsh ratio, don't tell me experiment. Answer: (AP Reply) Depends on what you want to do it with. Don't be lazy, try out what best works for you.